This is the second year that Dan Poeta, owner of Horizon Heating & Air, has made this significant gift that will support public education in Henderson County throughout the calendar year by impacting each facet of the Education Foundation’s programming and services. Horizon’s gift will support the expansion of the Leader in Me in the 2019-20 school year, bringing the school transformational model to Hillandale Elementary and Apple Valley Middle – the district’s first middle school to implement the Leader in Me. Additionally, the donation supports the Foundation’s fundraising events, including the annual Golf Classic on October 14, which is the largest fundraiser. The Golf Classic raises funds to support workforce development and curriculum initiatives in local schools. 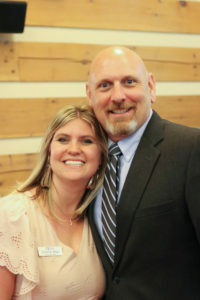 Pictured below: Dan Poeta, Owner of Horizon Heating & Air, with Summer Stipe, Executive Director, at the 2018 Education Celebration event.